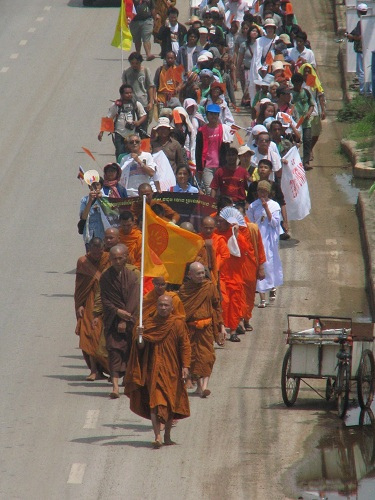 In April 1992, a small band of Cambodian refugees marched alongside orange-swathed monks, as they slowly made their way across the Thai-Cambodian border. 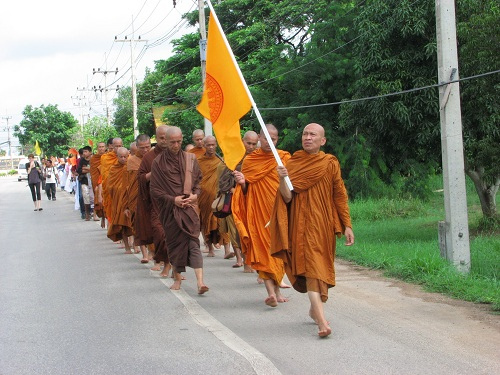 So began the first of what would become known as an annual Dhammayatria, or ‘procession for peace’. A diverse group of representatives from Thailand, Cambodia, Laos, Burma, Japan, Sri Lanka, Indonesia, Australia and Greece each took part in the three-day event. 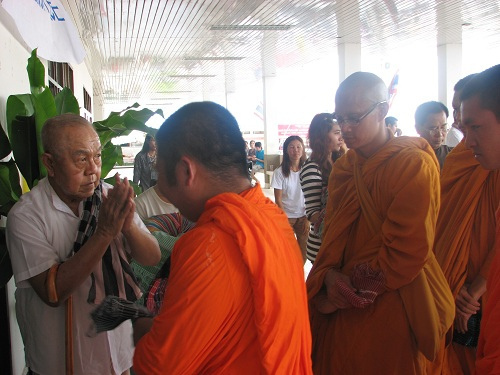 Set in the eastern border town of Aranyaprathet, some 300km northeast of Bangkok, religious leaders, local villagers, academics, students, peace activists and non-government organizations gathered to take part in both the symbolic peace procession and conflict mediation. 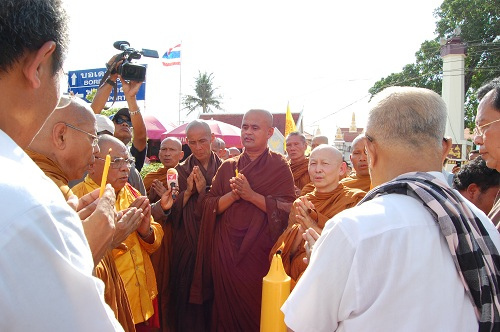 Calling for the gathered crowd to “create peace within, to walk together as one,” participants began their march at Wat Klongyang, before moving on to Wat Mai Sai Thong, along the city’s major highway. But for the sounds of 11th Infantry regiment soldiers at a local base, marching themselves in formation – “noeng, song, saam, si!” – little else could be heard. Over several kilometres, the crowd marched in silence, carrying hand-painted signs which called for “humanism, rather than nationalism”. Almost all were affected by the near-blistering forty-degree heat, with paramedics called upon to attend to any number of cuts and burns acquired from the searingly hot bitumen. Stopping briefly to attend to their wounds and recover, many of those affected continued onwards to complete the journey. Despite the difficult conditions, a number of observers noted the composure of the crowd, who maintained high spirits throughout. As events shifted from the completion of this symbolic act, discussion would soon turn to matters of conflict mediation and resolution. A number of representatives from Cambodia, many themselves survivors of the Khmer Rouge, spoke of having long since tired of the emotional, physical and financial strains, of constant warfare and uncertainty. 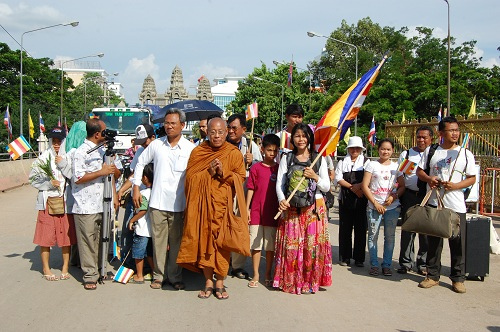 “Given the decade of diaspora return and national reconstruction in Cambodia, the Dhammayatria and its philosophy of non-violence have been a particularly powerful message for Cambodians tired of war,” academic Kathryn Poethig wrote of the first Cambodian Peace Walk, in 1992. Some two decades later, Khun Ros would reaffirm this sentiment. He felt that “we (Cambodians) already know Thailand is much better than other countries in Southeast Asia. But we don’t want to see it take a step backwards, becoming like Cambodia during the Khmer Rouge era. We have already sent a letter to the government, asking them to stop the war. 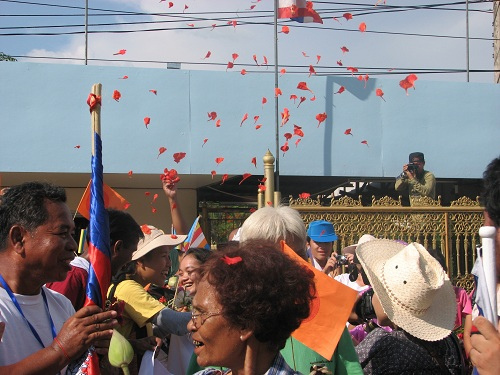 Local participants from both Thailand and Cambodia noted that they felt embedded in one another’s communities, with trade, families and cultures engaging across a national border most often described as ‘blurred’. At the concluding session, participants gathered in a local community hall. There, monks blessed the crowd, showered them with heavy drops of water. Hands were clasped and knots of friendship tied over across the symbolic, if fragile, border.